That's a decent catch there. The latest edition of TBM is all about this and it looks and sound fun. I suppose I might try it someday. That's a decent catch there. What tackle were you using? My bow is a Damon Howatt Hunter 60# @ 28", the reel (drum) was just the cheapest kit I found. Came with the spool, line, and one arrow with tip for $17 Had to put a safty slide on and grabbed another arrow and tip as well though. It's fun man, you should get it heck. 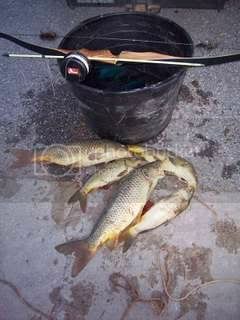 I just got back from bowfishing with a buddy this weekend. 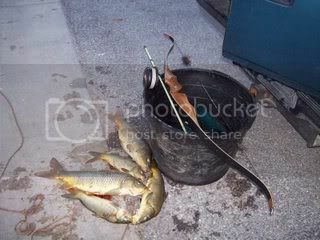 I shot two gar, that was all I got.